The recent release of the film World War Z, based on Max Brooks’ novel, has brought zombies to the forefront of literary attention again. They’re perennially popular with some readers, although for a long while it’s been a case of love ‘em or hate ‘em. However, there seem to be many shades of zombies now, so some should appeal to all tastes. I came across my favorite zombie in Nicholas Forristal’s The Chronicles of M, if ‘favorite’ is a word it’s OK to use in connection with an undead monster. This book is a fabulous combination of thriller, the paranormal, sci-fi, demons, fantasy, dark humour, action and, obviously, zombies. As well as being so successfully multi-genre, this book is one of the not-so-many examples of really effective writing in the present tense. This can trip up so many authors, but Nick Forristal isn’t one of them. In his hands, the present tense brings immediacy and atmosphere to his writing. He also handles multiple points-of-view expertly. This is something that can set some readers off on a rant when it’s disjointed and intrusive. However, with this author, as we move from one narrator to another, all that happens is that we see the full complexity of the action and characters he’s created. M, apparently a young sociopath, has been possessed by a demon, a soul eater. Retiree agent Samuel Horne is called in by Thomas, a man he’s never met before, to help control the unexploded bomb that M represents. He’s practically unmanageable and wreaks havoc whilst fighting evil with methods that aren’t sometimes that far off evil themselves. It’s hard going for Samuel. He encounters zombies, of whom Uhler, now a doctor, is a very unique example. He’s a Stage 5 zombie. I’m not going to explain so you’ll just have to read the book to find out about that and the other four stages. Samuel is introduced to the underground facility that houses M and his various support staff, much against his better judgement, although he does meet the likeable ditzy although highly intelligent Dixie and the accident prone coats (scientists). As repugnant as the demonised M is, he reaches out to Samuel who can’t give up on his mission to help M regain his humanity, especially once he learns the truth about M.
As well as being a hugely entertaining work of imaginative fiction, it’s also only the first in a series. 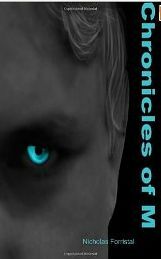 The second book is coming out very soon, so it is definitely time to read The Chronicles of M. That way you’ll be ready to pounce on the following instalment of the chronicles the moment they’re published. And you will not be disappointed … I can guarantee that.